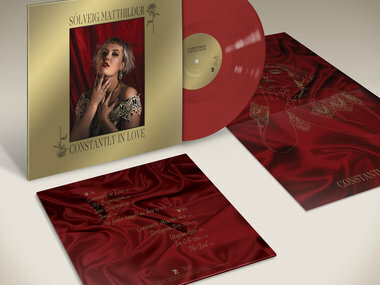 Constantly In Love – Dark, rose red vinyl edition with bonus mini-poster! 44 Days – Bundle 2: Both 7" editions, tote, embroidered beanie. 44 Days – Bundle 3: Everything. 2x 7", test pressing, tote, beanie. SDGXXV – Two different DOUBLE-VINYL editions! Nótt eftir nótt – 2nd pressing on fairy blue vinyl. Nótt eftir nótt – Limited clear vinyl with heavy-weight insert. Mecca Normal – Beautiful green vinyl, with a gorgeous Jean Smith poster insert! Outnumbered – CD edition with beautifully designed booklet. Why Aren't You Laughing? – Deluxe digipak with beautifully-designed booklet. Outnumbered – Gorgeous vinyl with mini-poster lyric insert! Crash Vegas – Happy birthday Brave New Waves! CD edition. Mecca Normal – Limited digipak CD edition, with bonus tracks! Canadian Electronic Ensemble – First-ever CD reissue! Iconoclast – The real-deal art-pop. CDs are for curmudgeons. Vol. 6 – CD edition, including BONUS TRACKS! Dead Quiet – Stoned CD edition! Soli Deo Gloria – APOP: Splatter Deo Gloria! Nótt eftir nótt – SUPPORT THE CULT: Vinyl test pressing + everything. Soli Deo Gloria – APOP: Soli Deo Gloria with Bonus Tracks! Nótt eftir nótt – CD digipak for late-nite rituals. Fjara / Runaway Train – Legend & Sólstafir: Fjara / Runaway Train CLEAR/SILVER wax! Deepsound – Deepsound 2-CD 6-panel digipak. Into the Sun – Freak Dream digipak CD ~ beauty design. Fateless – The Gatefold Vinyl edition will destroy you. Only The Heart Beats & Chrome Horizons – Only The Heart Beats & Chrome Horizons. TEST PRESSING. Future Past Tense – RATIONAL YOUTH. FUTURE PAST TENSE. CLEAR 10" VINYL. Youth Of Tomorrow – Youth of Tomorrow. Test Pressing. Plastic Heart – Plastic Heart. Test Pressing. Electrostatic – A regular ol' CD, but we promise the album is AWESOME! Fearless – Heavy-weight 180 gram vinyl, in a wide-spine sleeve. WarMech – FRONT LINE ASSEMBLY: Comatose 12"
Severed Heads – Severed Heads. Test Pressing. Deep Six – Limited green vinyl (only 300 copies)! Things Will Be Better In Hell – TESTS WILL BE BETTER IN HELL, too. WarMech – WarMech blacker than black vinyl version. WarMech – 2LP VINYL (HALF-HALF EFFECT), a few copies back! It Will Come To You LP – 2ND PRESSING ORANGE VINYL, YOU WILL NEED THIS. cub – CD Digipak! cub! Brave New Waves! cub – Limited edition black vinyl: 10" grooves cut into a 12" platter! Sidereal Decomposition Activity – Limited edition CD in a beautifully designed digipak. Phleg Camp – Phleg Camp CD Digipak - Brave New Waves session! Doom – Doom. CD Digipak. Doom – Doom. White Vinyl. It Will Come To You LP – It Will Come To You. CD Digipak. Grimoire – Grimoire. Green & Clear Inside-Outside Effect Vinyl. Against the Glass – Against the Glass. Vinyl. Incipience 1: Studio Tracks 1981-1982 – Incipience 1: Studio Tracks 1981-1982. Red Vinyl. Incipience 1: Studio Tracks 1981-1982 – Incipience 1: Studio Tracks 1981-1982. Vinyl. Incipience 2: Prerelease - Educated Man – Incipience 2: Prerelease - Educated Man. Clear Vinyl. Incipience 4: Live at LuvAFair October 6th, 1982 – Incipience 4: Live at LuvAFair October 6th, 1982. Blue Vinyl. Incipience 4: Live at LuvAFair October 6th, 1982 – Incipience 4: Live at LuvAFair October 6th, 1982. Vinyl. Incipience 4: Live at LuvAFair October 6th, 1982 – Incipience. 4LP Coloured Vinyl Boxset. Incipience 4: Live at LuvAFair October 6th, 1982 – Incipience. 4LP Fanpack: Includes Test Pressings & CD. Grimoire – Grimoire. CD Digipak. The Jazz Butcher – AUDIOPHILES UNITE! The Jazz Butcher. Vinyl. Incipience 4: Live at LuvAFair October 6th, 1982 – Incipience 4: Live at LuvAFair October 6th, 1982. CD. Psyche – Psyche: Brave New Waves Yellow Vinyl. Severed Heads – Severed Heads. Blue Vinyl. Severed Heads – Severed Heads. CD. Severed Heads – Severed Heads. Vinyl. The Jazz Butcher – The Jazz Butcher. Blue Vinyl. Psyche – Psyche: Brave New Waves digipak CD. Psyche – Psyche: Brave New Waves; audiophile black vinyl. Incipience 1: Studio Tracks 1981-1982 – Incipience. 4LP Coloured Vinyl Boxset. Incipience 2: Prerelease - Educated Man – Incipience. 4LP Coloured Vinyl Boxset. Incipience 1: Studio Tracks 1981-1982 – Incipience. 4LP Fanpack: Includes Test Pressings & CD. Incipience 2: Prerelease - Educated Man – Incipience. 4LP Fanpack: Includes Test Pressings & CD. Grand Rites – Grand Rites: 2LP Vinyl. Headcrack – Headcrack. Blue Vinyl. The Jazz Butcher – The Jazz Butcher. CD. Midnight Champion – Midnight Champion Fanpack. CD + Black 2LP + Cassette + Patch. Midnight Champion – Midnight Champion. 2LP Vinyl (Cream). Midnight Champion – Midnight Champion. 2LP Vinyl. Against the Glass – Against the Glass. Blue & Pink Half/Half Vinyl. Against the Glass – Against the Glass. CD. Grand Rites – Grand Rites: CD Digipak. Grand Rites – Grand Rites. Test Pressing. The Nils – The Nils. Brave New Waves Session. Black Vinyl. The Nils – The Nils. Brave New Waves Session. Green Vinyl. Against the Glass – Against the Glass. Test Pressing. Midnight Champion – Midnight Champion. CD. The Nils – The Nils. Brave New Waves Session. CD. We Only Love You When You're Dead – 2CD Digipak Deluxe. The Nils – The Nils. Brave New Waves Session. Test Pressing. Jale – Jale. Brave New Waves Session. Vinyl. Jale – Jale. Brave New Waves. Blue Vinyl. Rarities – The Diodes: Rarities. Vinyl. Action/Reaction – Action/Reaction. Test Pressing. Jale – Jale. Brave New Waves Session. CD. Rarities – The Diodes: Rarities. CD. Jale – Jale. Brave New Waves Session. Test Pressing. Rarities – Rarities. Test Pressing. SOL: A Self-Banishment Ritual – Sol. Blue Vinyl. SOL: A Self-Banishment Ritual – Sol. 2CD. 3TEETH – 3TEETH. 3TEETH. X-Day Yellow Vinyl. 3TEETH – 3TEETH. Audiophile Black Vinyl. Jr. Gone Wild – Black Vinyl. Jr. Gone Wild – Yellow Vinyl. 13 Engines – 13 Engines. Brave New Waves Session. Blue Vinyl. 13 Engines – 13 Engines. Brave New Waves Session. Test Pressing. 13 Engines – 13 Engines. Brave New Waves Session. Vinyl. Jr. Gone Wild – CD Digipak. The Pursuit Of Happiness – The Pursuit of Happiness. Brave New Waves Session. Green Vinyl. The Pursuit Of Happiness – The Pursuit of Happiness. Brave New Waves Session. Test Pressing. The Pursuit Of Happiness – The Pursuit of Happiness. Brave New Waves Session. Vinyl. Asexuals – Asexuals. Brave New Waves Session. Test Pressing. Jr. Gone Wild – Jr. Gone Wild. Brave New Waves Session. Test Pressing. 13 Engines – 13 Engines. Brave New Waves Session. CD. The Pursuit Of Happiness – The Pursuit of Happiness. Brave New Waves Session. CD. Only The Heart Beats & Chrome Horizons – Glamatron. Only The Heart Beats & Chrome Horizons. CD. Only The Heart Beats & Chrome Horizons – Glamatron. Only The Heart Beats & Chrome Horizons. Pink Vinyl. Only The Heart Beats & Chrome Horizons – Glamatron. Only The Heart Beats & Chrome Horizons. Vinyl. Rheostatics – Rheostatics. Brave New Waves Session. Blue Vinyl. Rheostatics – Rheostatics. Brave New Waves Session. Vinyl. The Grapes Of Wrath – The Grapes of Wrath. Brave New Waves Session. Purple Vinyl. The Grapes Of Wrath – The Grapes of Wrath. Brave New Waves Session. Vinyl. Rheostatics – Rheostatics. Brave New Waves Session. CD. The Grapes Of Wrath – The Grapes of Wrath. Brave New Waves Session. CD. The Grapes Of Wrath – The Grapes of Wrath. Brave New Waves Session. Test Pressing. Times – Pankow. Times. 10" Vinyl. Nocturnal Earthworm Stew – David Pritchard. Nocturnal Earthworm Stew. Black Vinyl with Etching. Nocturnal Earthworm Stew – David Pritchard. Nocturnal Earthworm Stew. Cream Vinyl with Etching. Nocturnal Earthworm Stew – David Pritchard. Nocturnal Earthworm Stew. CD. And You Thought You Were Normal – NASH THE SLASH. AND YOU THOUGHT YOU WERE NORMAL. 2LP VINYL. Decomposing – NASH THE SLASH. DECOMPOSING. VINYL. Decomposing – NASH THE SLASH. DECOMPOSING. CD DIGIPAK. Future Past Tense – RATIONAL YOUTH. FUTURE PAST TENSE. 10" VINYL. Mystery Hotel – Psyche. Mystery Hotel. CD. Unveiling The Secret – Psyche. Unveiling the Secret. 2LP Vinyl. Unveiling The Secret – Psyche. Unveiling The Secret. CD. Insomnia Theatre – Psyche. Insomnia Theatre. CD. All The Way Down – Dead When I Found Her. All the Way Down. CD. Rag Doll Blues – Dead When I Found Her. Rag Doll Blues. CD. Fateless – Decree. Fateless. CD. Every Thing ¬boxset (2013) – Mlada Fronta. Everything. 10CD Boxset. Night Run (2014) – Mlada Fronta. Night Run. Vinyl. Dreams And Nightmares – Nash The Slash. Dreams And Nightmares including Bedside Companion. 2CD Digipak. Children Of The Night – Nash the Slash. Children of the Night. CD. Decoder – Noise Unit. Decoder. 2LP Vinyl. Drill – Noise Unit. Drill. 2LP Brown-Orange Effect Vinyl. Drill – Noise Unit. Drill. 2LP Silver Vinyl. Drill – Noise Unit. Drill. 2LP Vinyl. Grinding Into Emptiness – Noise Unit. Grinding Into Emptiness. Blue Vinyl+7". Grinding Into Emptiness – Noise Unit. Grinding Into Emptiness. CD. Grinding Into Emptiness – Noise Unit. Grinding Into Emptiness. Red & White Half/Half Vinyl+7". Grinding Into Emptiness – Noise Unit. Grinding Into Emptiness. Vinyl+7". Response Frequency – Noise Unit. Response Frequency. CD. Response Frequency – Noise Unit. Response Frequency. Splatter Vinyl+7". Response Frequency – Noise Unit. Response Frequency. Vinyl+7". Response Frequency – Noise Unit. Response Frequency. Yellow Vinyl+7". Strategy Of Violence – Noise Unit. Strategy of Violence. 2LP Vinyl. Swan/Dive? – OUT OUT. SWAN/DIVE?. 2CD. Insomnia Theatre – Psyche. Insonnia Theater. 2LP Vinyl. Mystery Hotel – Psyche. Mystery Hotel. 2LP Vinyl. Thunderstruck / Underrated – Rational Youth & Psyche. Thunderstruck / Underrated. Orange 7" Vinyl. Magic Box – Rational Youth. Magic Box (Live 1983 + Archives CD). 3CD. Ganglion – Saltillo. Ganglion. CD. Monocyte – Saltillo. Monocyte. CD. Monocyte – Saltillo. Monocyte. Vinyl + 7" Vinyl. Monocyte: The Lapis Coil – Saltillo. Monocyte: The Lapis Coil. Vinyl. Madness & Extinction – Seeming. Madness & Extinction. CD. Worldburners EP – Seeming. Worldburners. 7" Vinyl. Lock Me Out – THE GLEN & JOE SHOW. LOCK ME OUT. 7" VINYL. Wrap Around Cool – Terminal Sunglass. Wrap Around Cool. CD. Wrap Around Cool – Terminal Sunglass. Wrap Around Cool. Vinyl. Leaning on Shadows – Valhall. Leaning on Shadows. CD. Throw Out Rite – PANKOW. THROW OUT RITE. CD DIGIPAK.